I love the tradition of the MAY DAY parade through the inner city of Fremantle, so took a lot of photos today. The weather forecast for 90% chance of showers tomorrow does not look good for the MAY DAY festivities and parade. The parade starts at midday from the Fremantle Esplanade from where it snakes through the inner city. It’s always a good and noisy spectacle to watch the hundreds of unionists with their flags and banners. Workers United….! There are food and information stalls, live music and activities, so bring a brolly or raincoat and join in anyway! A great Sunday and a great turnout for today’s traditional yearly May Day event in Fremantle. It was all about united workers’s rights, protection and solidarity and the Labor and Greens politicians turned up in numbers. New WA Labor Premier Marl McGowan addressed the unionists, while new Freo Minister Simone McGurk and Federal Labor MP Josh Wilson watched on. The MAY DAY event is being held by the unions on the Fremantle Esplanade today from 10 am to 2 pm with stalls and music and of course the noisy parade through town at midday. Not far from there in the Fishing Boat Harbour there will be free tours of the new Sea Shepherd vessel Ocean Warrior, so take the kids there and show them how important it is to be engaged and that people power makes a huge difference. It’s no good to whinge that THEY should be doing something about things when WE can make all the difference! Hundreds of unionists marched through the centre of Fremantle at midday today to celebrate May Day. It is always a colourful and noisy spectacle that reminds us all that it is important to support and protect the rights of workers in our nation, state and cities. There was a massive turn out for the Fremantle annual MAY DAY celebrations with hundreds of unionists and their families and dogs attending the yearly ‘pilgramige’ to the Esplanade. The colourful parade marched through the centre of Freo and brought traffic to a standstill for a short while, but as always May Day is very well organised, so there were no apparent problems. 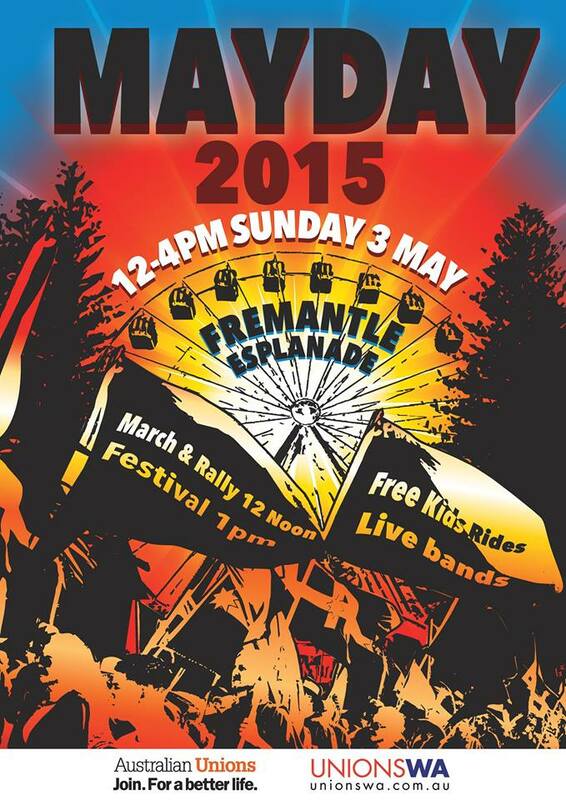 The annual MAY DAY celebrations and parade will be held in Fremantle again this Sunday on the Esplanade. There will be live music and entertainment, food stalls, a bar, and of course the unionists will march through the city centre at midday, so come and join the fun.